The truth is that we hadn’t heard many stories of sheer excitement about Chile. Of course, we knew about the fantastic landscape in the Atacama Desert or in the Chilean Patagonia, but we had also heard that people there are a bit snobby and unwelcoming, their Spanish is difficult to understand and that everything in the country is overpriced. 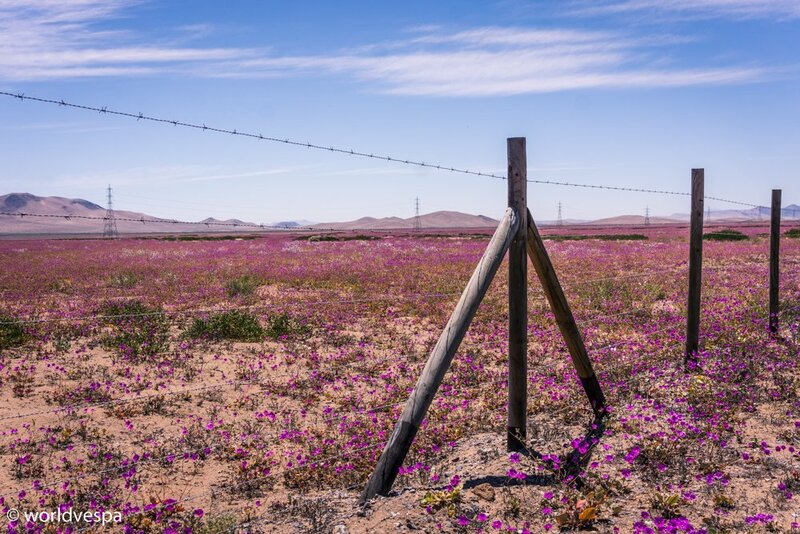 We had already seen how mass tourism can spoil the identity of a place in San Pedro de Atacama and we hoped not to see it again. However, we chose to do what we always do for every place we visit: clear our minds from all the stereotypes and leave the field empty to fill it in with our own experiences. The huge queue we saw at the border, when we crossed into Chile, made our smiles fade. Hot wind, sun and the odor of exhaust gas coming from all the vehicles waiting with their A/C on, was not the best first impression. 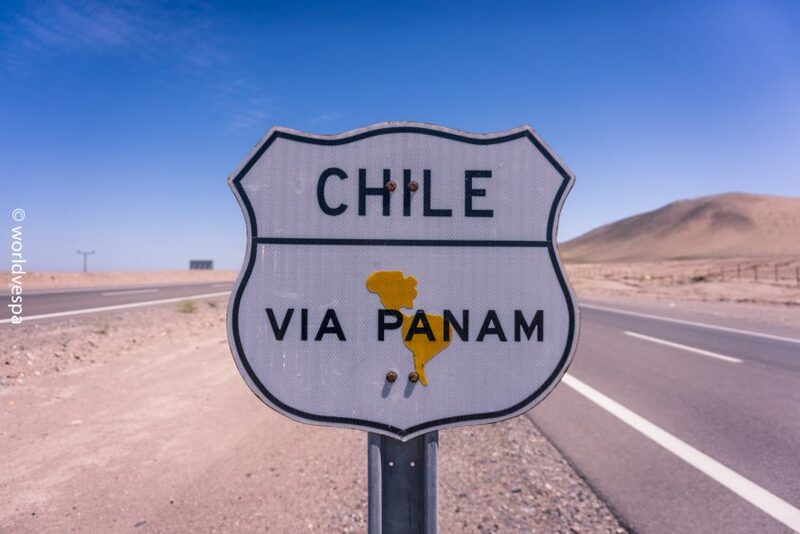 Chile, is the only country in South America (at least, from what we know) that fully applies the law of forbidding the import of certain goods within its territory. In order to avoid having one’s stuff confiscated, travelers should take into account certain regulations and not carry in their luggage unsealed food of vegetable/animal origin and handcrafts (of leather/wood). 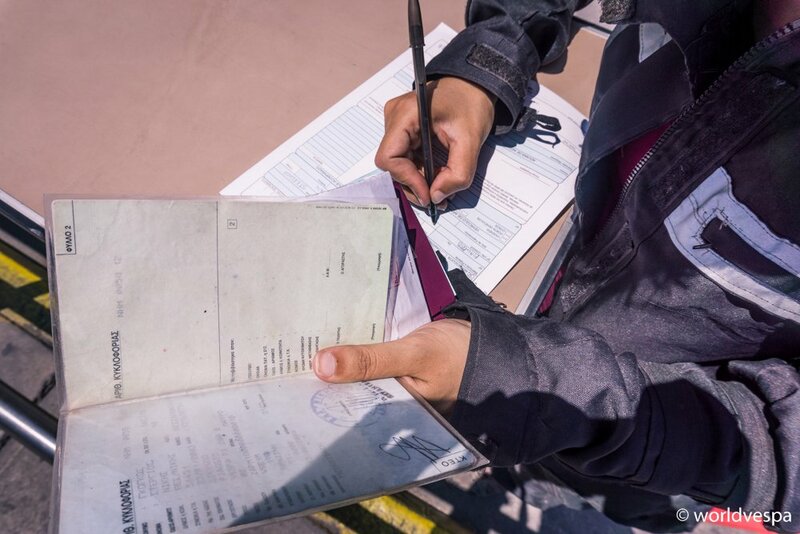 (REGULATIONS) The luggage inspection can be very thorough and it can take some time to finish the whole procedure. Luckily, since we were on a motorcycle, we were allowed to get directly to the head of the queue and that was the best thing that could happen, because immediately after that, we realized that we had to unpack everything and pass through an x-ray machine even our smallest bag. At least, we were prepared and we didn’t have anything “illegal” with us. From our very first kilometers on the Chilean highway, we found again something we had missed a lot: a good driving culture, compared to the countries we had been to earlier. Trucks were not trying to get us off the road anymore and the majority of drivers of almost any kind of vehicle, were waiting patiently until it was safe to overtake us. Later in Santiago, we heard many complaints about Chilean drivers and we experienced a few issues, but after having survived the roads of Peru, it was time to relax and enjoy the ride. 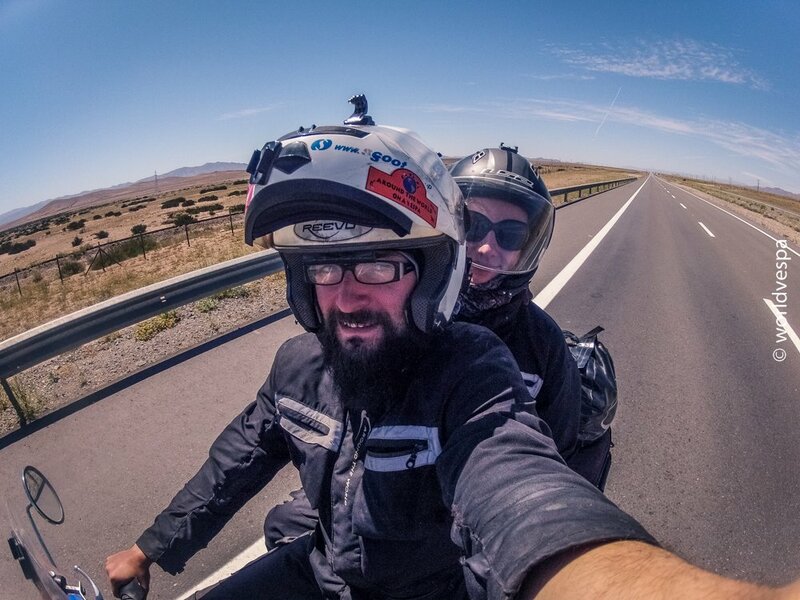 We had about 4,000kms ahead of us on the Chilean roads and this driving culture was the best we could ask for. After having survived the roads of Peru, it was time to relax and enjoy the ride. The geography of Chile has some interesting characteristics. One of them is that it is a very long and narrow piece of land between the Pacific Ocean and the Andes. It’s length covers about 4,500kms and its average width is about 450kms from its coast to its eastern border with Argentina. This geographical characteristic, makes Chile’s climate (and environment) also interesting. It’s northern part until the middle of the country is almost 100% desert and the rest of it towards the south, is one of the greenest parts we’ve seen, with a rainfall of 300 days per year. Its southernmost part is mostly icebergs due to its proximity to the Antarctic. 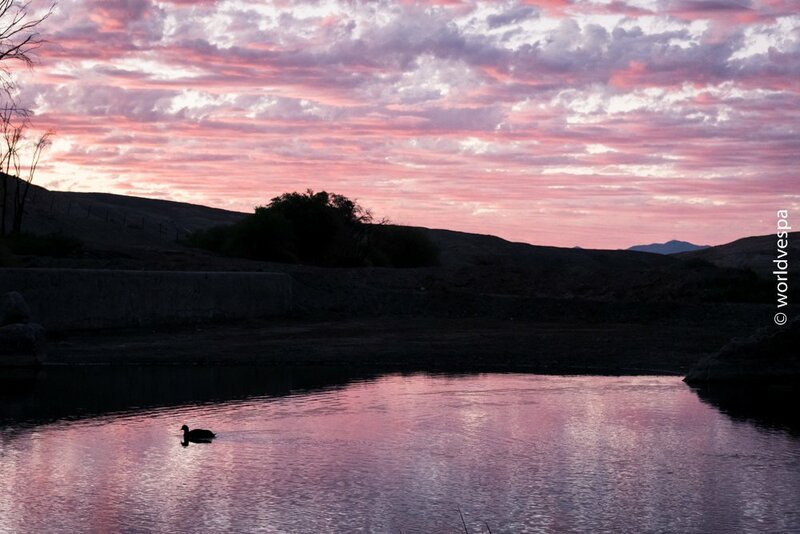 For the next days, we would get to know the absolute desert: Atacama! We traveled through the full length of the Atacama Desert (1,000kms approx.) and it proved to be quite an experience, though a bit dull at some points. For us, coming from a small country with no desert landscape and with quick changes between environments, the never ending straight line of the Panamerican Highway crossing Atacama, was both unique and boring at the same time. 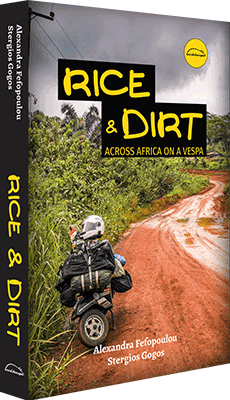 Various kinds and sizes of rocks, gravel, sand…Life in the Earth’s driest place isn’t easy. 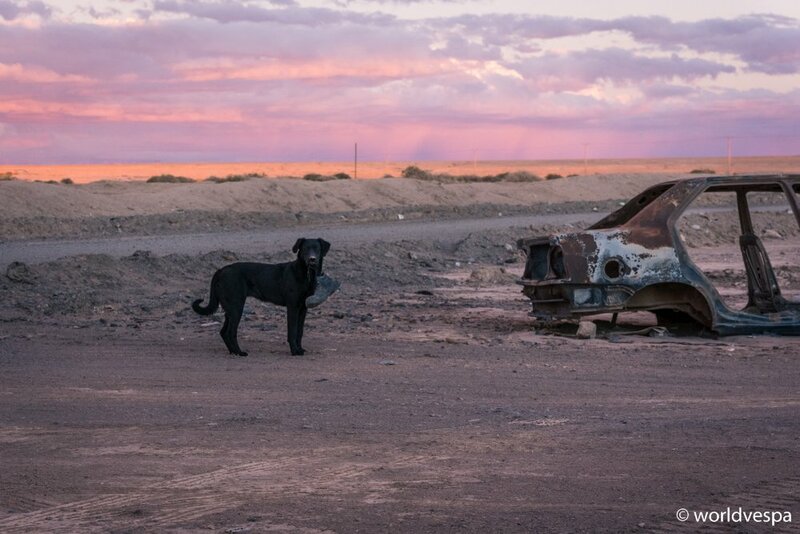 We can’t even imagine how is the everyday life of the people who live in the numerous towns of the desert. Almost all of them are there due to the huge mining industry in the area, but how’s life when you can’t see anything green? We spent our first night in Chile in a small cheap room in the village Huara, on the Panamerican Highway, but from day 2, we already made our plans for wild camping. According to the GPS, some 15kms south of the town “Maria-Elena”, there was a campsite, so when we saw the sign “Balneario Coya Sur”, we got happy and a bit confused. I knew that “balneario” means “spa”, but weren’t we in the desert? 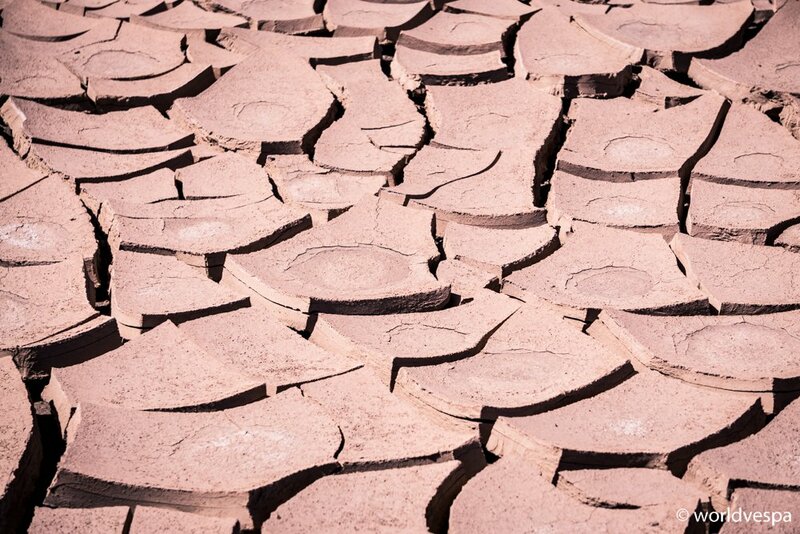 When it comes to “balnearios”, we were already aware that they may be any kind of place with water: a pond, a river, a lake, the sea…but, we were in the desert. It soon became clear that this “balneario” was a picnic/camping spot near a creek which, as we saw later on the map, is River Loa. Unfortunately, the whole place seemed abandoned but when we got there, there were some people having a barbeque (asado) and splashing through the shallow water. Until the sunset, they had all left the place and we enjoyed a good night sleep. Early next morning, the cleaning service of the municipality came to pick the garbage from the campsite and offered us a cheerful awakening. Too late guys, we’re going now! 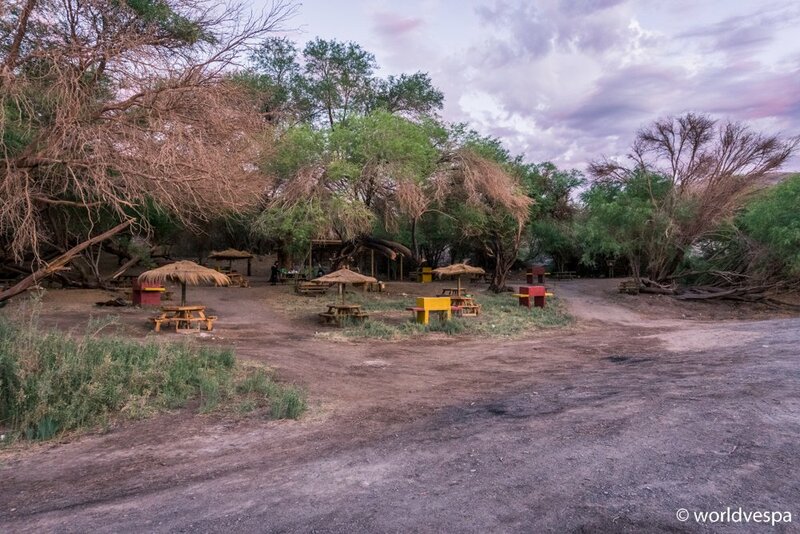 Our next night in the desert would me slightly more adventurous than usual, but this was something we couldn’t have predicted when we pitched our tent next to a gas station, on the Panamerican highway. The place was called “Agua Verde” and it was just a spot on the map. No village or any other settlement, except for the gas station and a restaurant with some rooms for the truck drivers. The colors of the sunset, the dust due to the wind and the trucks, made a somehow creepy scenery, but apart from taking some nice pictures, we ignored it and started cooking our lentil soup. Soon, a couple on a motorbike arrived. 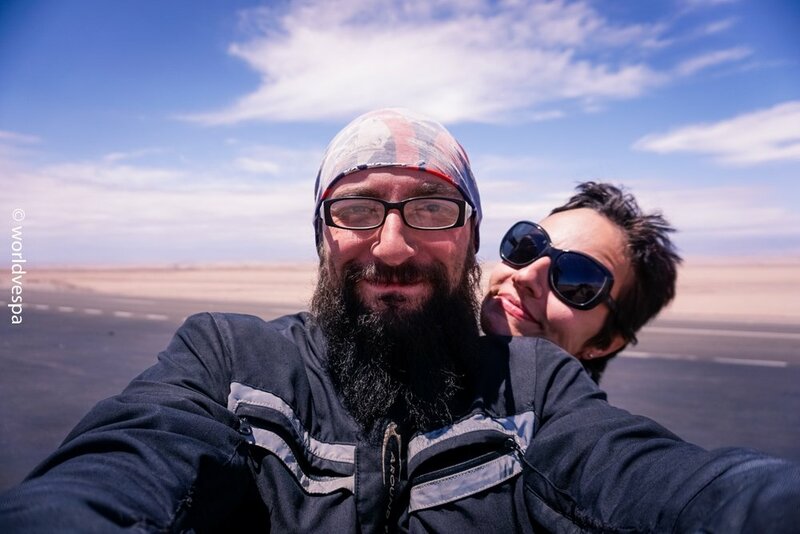 They were two Colombians who were traveling on the Panamerican, from their place towards Ushuaia on a V-strom. They laughed a lot with our fully equipped kitchen and they couldn’t believe their eyes when they saw our pressure-cooker. A playful puppy became member of our group for the night and we all shared dinner, telling stories and exchanging useful information. Last thing we did before we zipped up our tents, was to make sure that the puppy couldn’t steal anything from the porch. We did a terrible miscalculation of the puppy’s determination and persistence and when, after several hours, I had to get out of the tent, I realized that my shoe wasn’t there anymore. Wearing Stergios’ boots, I kept looking for my shoe for some time, but in vain. I found a huge desert scorpion, some terrifying insects and a small animal which didn’t give me the time to recognize it. The next morning, Stergios managed to find the missing shoe next to the fuel pump but until that time, it was so abused that he preferred to throw it away and courteously offer me his boots to wear them until the next place were we could buy a new pair. 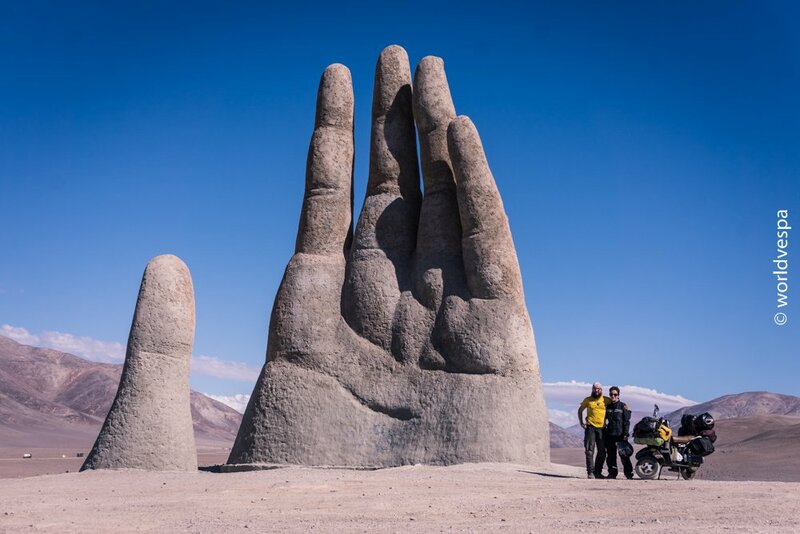 With a sense of high professionalism, he drove some hundreds of kilometers through the Atacama Desert, wearing his flip-flops. The desert landscape is amazing, but we had been traveling for more than 1000kms without seeing any major changes to the environment, only the size and colors of the rocks and the sand. After all this time in the desert, we felt we needed a change, so when we saw on the map that in the town Bahia Inglesa there were some campsites, we decided to spend at least on night there. Unfortunately the high season hadn’t arrived yet, so all the campsites except one were closed. This last campsite, where we finally stayed, wasn’t exactly open. They were doing the annual maintenance before the summer, but well, we didn’t need to have all its amenities available. Just a spot to pitch the tent. We were so close to the ocean. Our tent was on the beach and the almost white sand gave our feet a very pleasant feeling. The only thing that stressed us a bit was the tens of tsunami warning signs everywhere around. Depending on the altitude, there were the red ones for serious danger, the yellow ones for average danger and the green ones for no danger. By staying on the beach, you get a serious red one! After having survived the night with no tsunami, the next morning we made coffee and greeted the new residents of the campsite. They were travelers who had found the only place that was open and came to spend a night or two. We had decided to continue though, so soon after breakfast, we left. The harsh environment of the desert had started to be milder, but the wind was still so strong that it was impossible to talk to each other. During the countless silent hours on the Vespa and with the sun directly on our heads, we noticed that the hills around us, as far as the eye can reach, were pink. 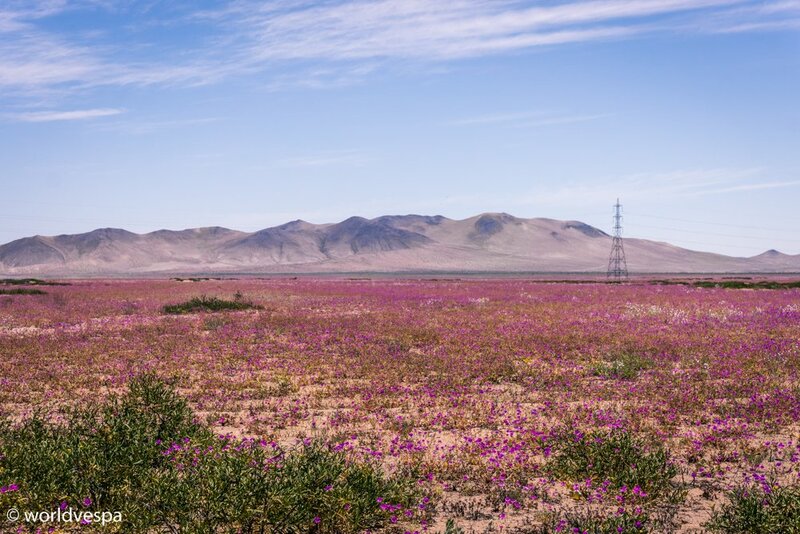 We were there to see a rare phenomenon: the wind had brought the seeds from the south and at the same period, the climate of the desert was as humid as it can get, so we saw the desert blossoming pink! These were our last kilometers in the Atacama. Next stop, La Serena. This city is a holiday resort on the beach, but when we got there it was only a month after a big earthquake (magnitude 8.4) hit the area and a tsunami destroyed a part of the beachfront. At first we didn’t notice it, because when we drove through the coast road, the high luxury buildings caught our attention. The casino, the posh restaurants and cafeterias and the huge apartment blocks were a clear sign of wealth, at least at this part of the city. 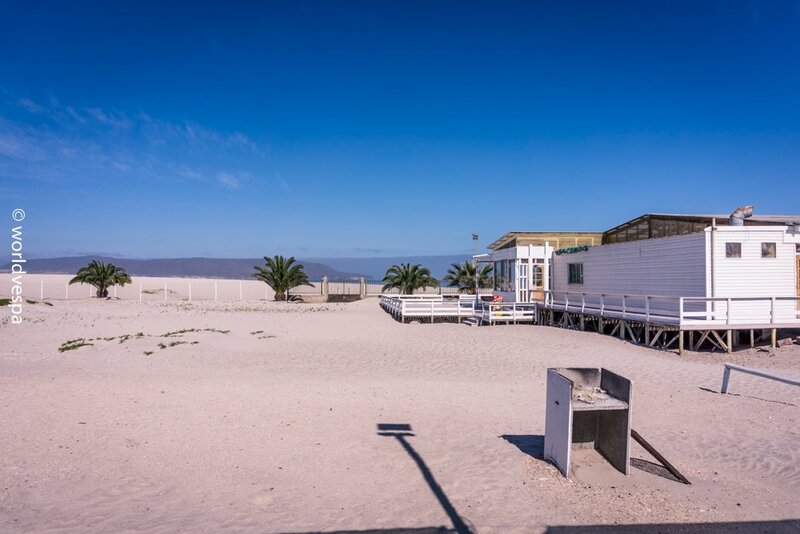 Only when we stopped at a canteen and asked why we couldn’t find any campsite, the owner made us take a closer look at the beach and explained why we probably wouldn’t find campsites in La Serena. We saw that all the wooden constructions on the beach were torn down and we understood what the Chileans meant when they were telling us that it’s not the earthquakes but the tsunamis that they’re most afraid of. The search for a campsite soon proved pointless, as the owner of the last one explained us that camping is now forbidden in the area close to the sea. Everyone who owned a campsite has sold the land or constructed luxury bungalows for tourists. That was it, we were trapped. The dark had fallen and we were unable to move away from the city and find a place to pitch our tent. In tricky situations like this, there is only one thing that helps: food! We returned to the canteen, ordered something bad for our health and asked the owner’s opinion. He told us what could be a reasonable price for renting a bungalow and sent us back to the last ex-campsite we asked. The owner of the place had made “cabañas” – bungalows now and he gave us a very reasonable price indeed, so we decided to stay there. For us it was the most luxurious place we had stayed during the whole trip. Fully equipped kitchen, bathroom with a bathtub and a king-size bed! What else was there for us? An allergy! Wait, what allergy?! After taking our time to realize where we were, Stergios went for a shower and it was then when he realized that he was all red and full of rashes! Long story short, that night wasn’t the best we could have, but at least we didn’t need to look for a hospital. The antihistamine pills we carried with us helped him and after some hours he was fine. We never understood what caused this reaction…maybe he couldn’t adapt to the sudden change to luxury! That was it! The next morning we left behind our cabaña and continued towards Santiago. We estimated that we could be there in one day, but we preferred to delay our arrival for one more day, in order to make it to Santiago before noon. We’d rather have many hours of daylight ahead of us when we enter a big city. All campsites on our way were closed because the holiday season wasn’t on yet, but when we found one with an unlocked gate, we entered and pitched our tent among the high pine trees and close to the beach. The next day we’d finally get to the capital of the country. From the day we first entered Chile, it took us one week to get to Santiago. 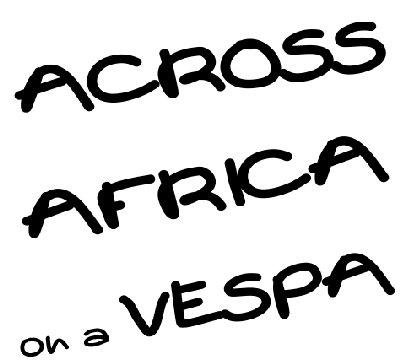 Not bad at all for the Vespa, which made an average of more than 300kms per day and almost always with a strong wind against! 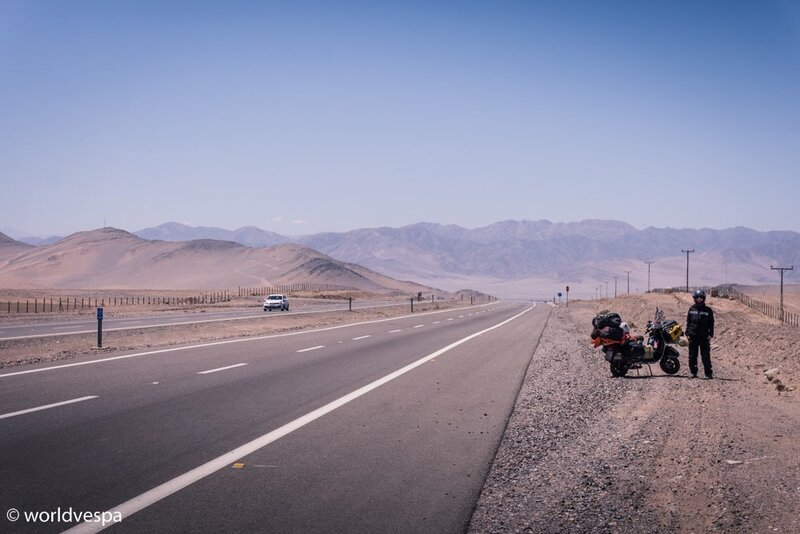 The majority of the motorcycles –with Chilean license plates – we met, were new GS1200 and from what we learned later from a motorcycle mechanic in Santiago, the last few years BMW sells a lot in Chile. 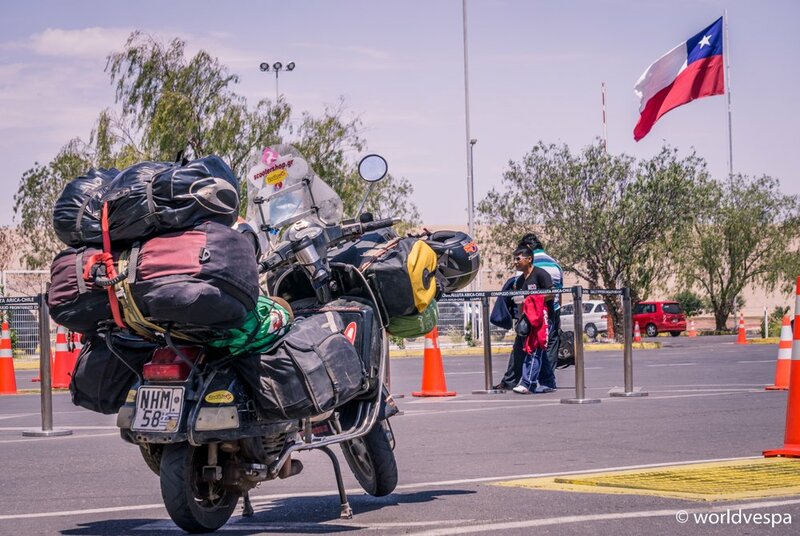 Of course, on the Panamerican highway, we saw various kinds of motorcycles from different countries, but the Chilean riders had one thing in common: they ignored us and almost no one greeted us. We had started wondering whether this stereotype of Chileans being unfriendly was true, but we continued greeting everyone, regardless of their reaction. We didn’t want to draw any mistaken conclusions. As we were getting closer to Santiago, the scenery changed a lot. It had now become greener with many avocado and chirimoya trees. The climate in this particular area is ideal for the cultivation of these fruits and we already thought of adding them in our diet when we’d get to the city. While waiting in the queue at a gas station, the driver of a van filled with chirimoyas probably read our thoughts. He came towards us, told us that he had a motorcycle and loved traveling and after a small chat, he offered us some fruits. We immediately felt relieved thinking that there are good people everywhere and that it was a mistake to judge from such a small number of random incidents. Before we realized it, we were already in the outskirts of Santiago and we soon entered the capital of Chile. What would it be like? Who would we meet? How would we spend our time there? Hello Enrique and thank you for the comment! Safe travels and we hope to meet you sometime / somewhere! Thanks for the comment Willi, we’re very happy you like the story! Have fun! Cheers, Stergios & Alex.